Developed for children ages 3-10, 10 & Under Tennis is an exciting new-play format for learning tennis. The program is designed to bring kids into the game by utilizing modified courts, specialized equipment and simple scoring, all tailored to age and size. We offer several different class times throughout the week to accomodate busy families. Come out and give tennis a try! To develop the most versatile tennis players within their specific style of play while stressing physical, mental, and emotional development equally. To encourage the highest quality character traits in every junior player while maximizing their playing potential and stressing the highest standards of sportsmanship and work ethic in a fun high energy environment. The junior delvelopment clinics is group tennis instruction for children 3-18 years old. We offer programming for every age and skill level. Our 10 & Under program is taylored for the smallest tennis player. Our High Performance Clinics are designed for our top level players with a commitment to Glen Creek Tennis Club and to obtain a sectional or national ranking. There is a clinic for everyone. Contact Mike Ridener for placement in the program. 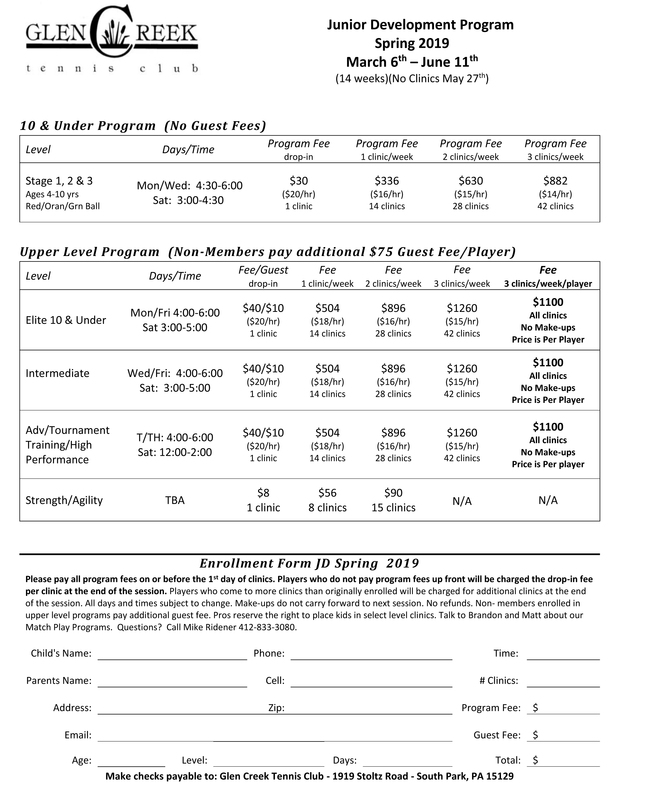 Junior Matchplay Program is available for intermediate and Tournament Training level students. This is a three-person team format based on a student's Junior Development Clinic level. Matchplay is an in-house program and all matches are played at Glen Creek. Matchplay is a complement to your child's drill clinic, and provides a continuous regular forum for your child to learn to play advanced doubles as well as giving them a regular challenge ladder singles match. Over the years Glen Creek's junior program has produced some of the best all around tennis players in western PA. One of our greatest sources of pride as a pro staff over the years is the success of our juniors doubles players have experienced at the WPIAL and PIAA levels. Glen Creek Tennis Club offers walk-on time for our JUNIOR CLUB MEMBERS who are participating in the current Junior Development session AND are current with their payment for that session. Any junior club member can call the club and see if there is unreserved court time. If there are courts available they may walk-on for no court fee charges. This is only available for UNRESERVED court time. This is a program for beginning to intermediate junior players who are looking for some fun competition and some travel to other local clubs. We travel or host USC, Peters and Mt. Lebanon travel teams. Travel team occurs either once or twice a month and is designed to help beginning to intermediate tournament players begin to understand and practice competitive play in a low key environment. There is usually pizza afterwards! This program is a monthly sign up. There is no lengthy commitment. Contact Mike Ridener at 412-833-3080 if you are interested in Travel Team. Our teaching pros can work with you on an individual basis to improve your game. Cost varies based on your teaching pro. Click here to see teaching pros and rates. Would you like to be on the court with your doubles partner to work on specific drills or strategies? Schedule a semi private lesson with one of our top notch teaching pros and let them work with you on tactics and techniques that will make you a dynamic duo! Click here to see teaching pros and rates. Come work on your game with 3 or 4 student to teacher ratio. This is a great way to practice live ball drills, doubles techniques, and serve and return to play out points. Click here to see teaching pros and rates.